Take Current Affairs quiz March 18, 2019 to enhance your General Awareness. Practice with our esteemed Current Affairs quiz March 18, 2019 questions which covers all important events across India as well as World. Make use of all important Current Affairs quiz March 18, 2019 questions with answers updated here, at free of cost to succeed in all competitive Exams and Interviews. Who is the Minister of Foreign Affairs for Maldives? Abdulla Shahid is the current Minister of Foreign Affairs for the Maldives as of the 2018 election. Which of the following is Indian Navy's Scorpene submarine? Which of the following Dock is manufacturing six Scorpene submarines under technology transfer from Naval Group of France? Mazagon Dock Limited (MDL), Mumbai, is manufacturing six Scorpene submarines under technology transfer from Naval Group of France under a 2005 contract worth $3.75 bn. Which life Insurance launches Special Mentorship Programme Wings? Aviva Life Insurance launches Special Mentorship Programme Wings. Nara Lokesh is one among the Indians featuring in the list of Young Global Leaders, according to the World Economic Forum (WEF). He is the IT minister of which state? Andhra Pradesh IT minister Nara Lokesh, BJP MP Poonam Mahajan and Xiaomi India head Manu Kumar Jain are among the Indians featuring in the list of Young Global Leaders, according to the World Economic Forum (WEF). The Board of Control for Cricket in India (BCCI), announced Dream11, India’s Biggest Sports Game, as the Official Partner for the VIVO Indian Premier League (IPL). Who is appointed as the Next Ambassador Of India to the Republic Of Uzbekistan? Santosh Jha is appointed as the Next Ambassador Of India to the Republic Of Uzbekistan. Who became the second Indian woman golfer to win an event on Ladies European Tour? Diksha Dagar became the second Indian woman golfer to win an event on Ladies European Tour after clinching South African Women's Open in Cape Town. RBI allowed HDFC Bank to hold only ____% in Bandhan Bank. HDFC, India’s largest mortgage lender, which has agreed to merge its low-cost arm Gruh Finance Pvt. Ltd. with Bandhan Bank, can hold 9.9 percent in the bank, according to its exchange filing. Kotak mahindra Bank appointed KVS Manian, Gaurang Shah as board directors. In which Indian State was the West Nile Virus recently found? Which Indian state shows highest climate change vulnerability? The assessment shows that the vulnerability index is the highest for Assam (0.72) and Mizoram (0.71). Sikkim is the least vulnerable state with the index being 0.42. Which of the following has been reinstated to the Asian Games 2022 edition? Olympic Council of Asia (OCA) decided to reinstate the Chess game to the Asian Games fold for the 2022 edition in Hangzhou. Which of the following former ISRO scientist has been conferred with the Padma Bhushan by President? Four-time Goa Chief Minister Manohar Parrikar passed away recently. 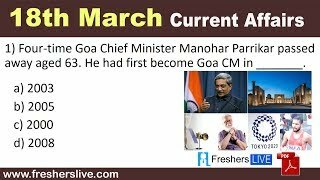 He had first become Goa CM in _______. Who is the first Indian athlete got qualified for Tokyo Olympics? K.T. Irfan is the first Indian athlete got qualified for Tokyo Olympics. Are you looking for right place to enhance your Knowledge on Current Affairs of 18th March 2019 through effective Quiz section? FreshersLive grants you the advantageous Current Affairs Quiz questions with accurate answers for 18th March 2019 which covers all the important events, supreme Awards, major occurrences in the National as well as World level. All important Current Affairs Quiz questions of 18th March 2019 are updated instantly in this page. Everyday at least 25+ Current Affairs Quiz Questions are displayed in this FreshersLive page. Correct Answer for each quiz question is given at the end of the entire 18th March 2019 Current Affairs Quiz questions section. You can estimate and upgrade your GK by attending these useful quiz questions. Entire quiz questions of 18th March 2019 Current Affairs covers Competitive Exam as well as Interview point of essentially important topics like International News, National News (ie. Indian Affairs), Science & Technology News, Environmental News, Bills & Acts Passed by Government, Defence News, About important Persons, Places, Banking & Economical News, Awards & Honours, Sports News, Revolutionary Updates on Arts & Culture, Obituary, Summits & Conference, Important Committee, Schemes, Appointments, Important Days & its Theme for Current as well as upcoming Year, Books & Its Authors, Agreements & MoUs, Budget, Taxes, Various Important Lists & Indexes, Visits by World Presidents, Prime Ministers, Political affairs and all Current Events. 18th March 2019 Current Affairs Quiz Questions updated in this page are prepared in the sense to help all aspirants to succeed in various Competitive Exams like UPSC IAS and other Civil Services Examination, Various Bank exams like IBPS PO, IBPS Clerk, SBI PO, SBI Clerk, RRB PO, RRB Assistant, Insurance exams like LIC AAO, UIIC Assistant, Railway Exams, Various Central Government Exams like SSC CGL, SSC CHSL, and more. Attempt all the Current Affairs Quiz Questions of 18th March 2019 and evaluate your score by matching your response with the correct answers mentioned at the end of this quiz questions section. By practising the FreshersLive Current Affairs Quiz Questions on a daily basis, you can surely succeed in the competitive exams as well as the interviews easily. Make use of this ultimate resource to the fullest and quickly achieve your goal!